Thin is in, and that doesn’t only apply to supermodels. 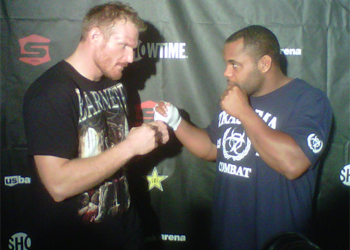 On Thursday, Strikeforce announced their heavyweight division will soon be a thing of the past. After the Heavyweight Grand Prix wraps, the tournament winner will then fight one more time against a top tier 265-pounder before Strikeforce eliminates the weight class from their lineup. “What you’ll see after the event with the tournament finals between Josh Barnett and Daniel Cormier, you’ll see one more fight where the winner will fight a top-rated heavyweight and then we’re going to go back to focusing on our other weight classes,” Strikeforce CEO Scott Coker shared during Thursday’s conference call. UFC president Dana White, who has been working closely with Strikeforce since October, fingered the lack of depth in the division as the primary reason for abandoning the weight class. White didn’t confirm what the future holds for Strikeforce’s current heavyweights, but it is assumed the field’s top performers would be transitioned to the UFC in order to bolster the Octagon’s roster. A definitive date hasn’t been set for when the Heavyweight Tournament will resume, but Coker reiterated that they are still targeting the end of Q1 2012.